Hi! 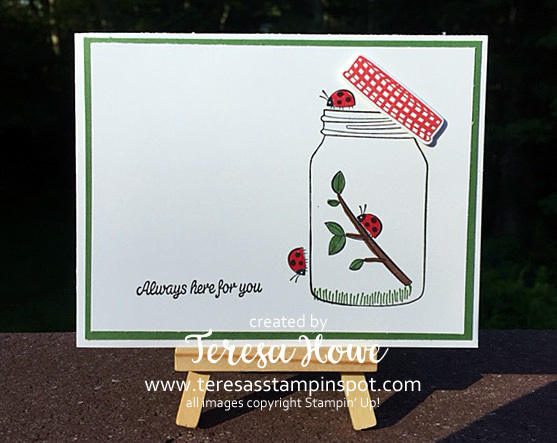 Today I have a card we will be making at the July 14th Ronald McDonald House Charity Class featuring the Sharing Sweet Thoughts stamp set. Did you know that $3 is donated to RMHC for each Sharing Sweet Thoughts set purchased? You can also use the set to make cards to donate to your local Ronald McDonald House! At the event on July 14, guests will be making 2 each of 4 cards – with guests keeping one of the cards, and the other being donated to a local house. If you are local to Northboro, MA and would like to join the class LIVE – please send me an email: teresa.howe@verizon.net by July 6th. The class is $35 and includes the Sharing Sweet Thoughts stamp set. If you’d like to add the framelits to earn the Bonus Days coupon, you may do so for an additional $33. Just note that in your RSVP. This set coordinates with the Everyday Jar Framelits. Colors for this card are Basic Black Archival, Real Red, Chocolate Chip and Garden Green. I am offering those who cannot attend but purchase the stamp set by July 14th using Hostess Code: 29ZK42G6 directions for the 4 cards we will be making. Add the Everyday Jar framelits, and you will also receive a $5 BONUS DAY coupon good toward a purchase in August! 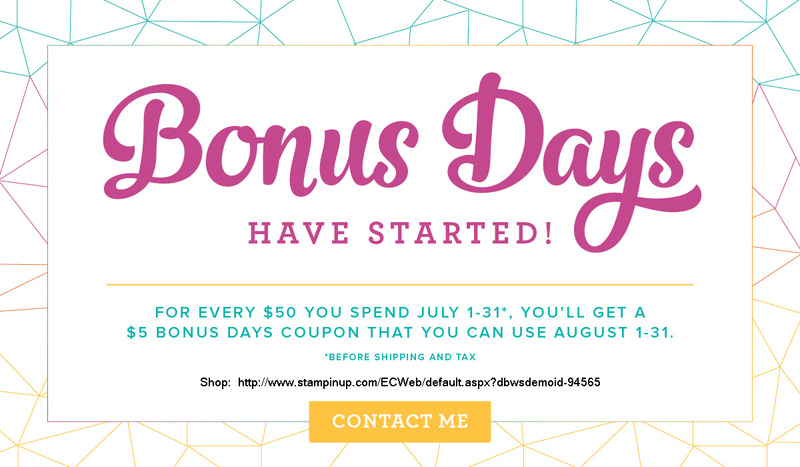 Bonus Day coupons are emailed by Stampin’ Up! to you! DO NOT DELETE THEM!! They cannot be reissued! Have you seen the new catalog and want it all? Consider joining my team and saving on your future purchases!! You customize your kit, your way!! Choose $125 worth of products and pay just $99 + tax! PLUS – get this great Essentials Pack FREE!!! Bringing your Kit value to to almost $200!! PLUS – You also get a FREE Past Paper Pumpkin kit!! There is no obligation to place a future order – so you can also order the kit to save some money! Have questions? Just ask! I’m happy to answer them! If you are ready to join, click here to JOIN MY TEAM! !